WASHINGTON – More powerful than bodybuilder-turned-governor Arnold Schwarzenegger? It’s true if you’re Sister Carol Keehan. The issue isn’t about who can lift the greatest weight in the gym. It’s about who’s got more muscle in the health care arena. Sister Carol, a Daughter of Charity who is president and CEO of the Catholic Health Association, the trade group for Catholic hospitals, finished first in the sixth annual reader poll conducted by Modern Healthcare magazine of the 100 most powerful people in health care. Schwarzenegger, the governor of California, finished third. Mitt Romney, Republican presidential candidate and former Massachusetts governor, was second. Sister Carol topped all comers, including presidents, presidential candidates, congressional movers and shakers, federal officials, hospital executives, educators and public policy vanguards in the survey, which was published Aug. 27. She was ranked 26th in the 2006 survey. Sister Carol had just assumed the CHA presidency the previous November. But being the most powerful doesn’t get you everything. “Quite frankly, I think we won’t have health care reform worthy of this country until the American people demand it,” Sister Carol told the magazine. Sister Carol, 63, has been a member of the Daughters of Charity for 43 years. She is the first woman to have ever topped the Modern Healthcare list, as well as the first former bedside nurse and the first former hospital CEO to make it to No. 1. Over the past year, the CHA, under her leadership, has stumped for renewal of the State Children’s Health Insurance Program, lobbied for greater access to health care for all, and advocated for the continued tax-exempt status of hospitals. Prior to assuming the CHA presidency, Sister Carol had chaired the board of Sacred Heart Health System in Pensacola, Fla. She had also headed Providence Hospital in Washington for 15 years. – Anthony Tersigni, president and CEO of Ascension Health in St. Louis, 15th. – Joseph Swedish, president and CEO of Trinity Health in the Detroit suburb of Novi, Mich., 22nd. 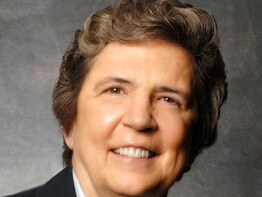 – Sister Mary Jean Ryan, a Franciscan Sister of Mary who is president and CEO of SSM Health Care in St. Louis, 49th. – A. David Jimenez, chief operating officer of Catholic Healthcare Partners in Cincinnati, 72nd. – Lloyd Dean, president and CEO of Catholic Healthcare West in San Francisco, 73rd. Apart from Sen. Barack Obama, D-Ill., who placed 10th, he is the highest-ranking African-American on the list. – Kevin Lofton, president and CEO of Catholic Health Initiatives in Denver, 93rd. Lofton is also chairman of the American Hospital Association.